We use the highest-quality ingredients—including cream, vanilla beans, and couverture chocolate—and make everything from scratch to create extraordinary desserts and artisan lunch bowls. Sweet Caribou uses local ingredients—like Alaska grown produce, fireweed honey, and Summit Spice teas to support other local businesses. We believe in top-shelf service to our clients + community. We donate to local organizations addressing causes such as childhood hunger and poverty. Born and raised in Anchorage, Alaska, James worked his way up from a busboy at the Moose's Tooth to manager of the Bear Tooth in college. He left the restaurant industry and earned his Master's in Fisheries Management, publishing a book on the pollock fishery. He was working on his PhD, but the food and fun of the restaurant biz enticed him to start Sweet Caribou (named after a hunting trip to Adak). James’s sister, Barbara Strong has been sweetening up family members’ and friends' special events for years with Parisian macarons, cupcakes, and other handcrafted desserts. Barbara has an exceptional palate and is a perfectionist when it comes to designing recipes. James started Sweet Caribou to share Barbara's incomparable desserts. 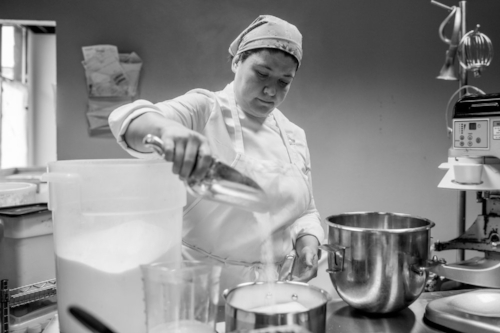 Sam is a graduate of the University of Alaska Anchorage’s culinary arts program, and furthered her studies with a “graduate-school” year as a lab assistant for Chef Vern at UAA. She worked at Haute Quarter Grille handcrafting breads and pastries before coming to Sweet Caribou. James’s wife Miranda, their two sons JJ and Calvin, and Alicia’s son Benji successfully navigated a very competitive application process to work in quality control. They work very hard sampling macarons and other Sweet Caribou items to make sure everything tastes delicious. Sweet Caribou macarons have Alaska-sized flavor, are gluten-free, and delicately delicious. We are Alaska's macaron mecca! Not to be confused with coconut macaroons, our Parisian macarons are made with almond flour, making them naturally (and deliciously!) gluten free. Sweet Caribou visits Paris annually to train with Parisian pastry chefs and research the latest trends in high-end patisseries. Though Sweet Caribou's focus is on macarons, we also craft artisan cupcakes, cookies, brownies, blondies, and other treats. C’est bon! Sweet Caribou is excited to share locavore, gourmet lunch bowls with Anchorage! We deliver artisan, locally sourced lunch to you (dessert included, mais oui! ), so you can relax and nourish yourself. Redefine fast food with a fresh, delicious meal—just text your name, order, and address to 907.223.5160, Monday-Friday from 9-2! Sweet Caribou caters, specializing in show stopping macaron towers and artisan lunch bowls (macaron included!) guaranteed to revitalize your workday. Call, text, or email for delivery and catering information: 907.223.5160 | sweetcaribouak@gmail.com. Want to inspire your team or business relationships? Look to Sweet Caribou macaron gift boxes, macaron towers, cupcake mason jars, to say “well done” or “thanks for the referral.” We also cater meetings and business lunches—add a macaron tower for an impressive touch.